Our Ignite Campaign began with a conversation in 2005 between Howard R. Lipman, then Vice President of Advancement, and retiring professor Stephen (Steve) M. Fain. They both felt it was time to encourage FIU faculty and staff to give back to our University. Steve agreed to serve as founding chair of this effort, with the understanding that the program would not simply celebrate "big givers," but focus on recognizing those making sincere gifts – no matter the size. Howard proposed donor-directed giving, allowing potential donors to create and support specific projects that dealt with issues, problems or potentials that represented their particular interest. Upon receiving their gifts, the campaign would provide the services required to gather and protect the funds raised. In 2006, Howard left FIU before the initial fundraising model was implemented, and it lay dormant. Upon Howard's return to FIU in 2010, the duo reunited and rekindled the flame that would soon become the Ignite Campaign. A small steering committee formed, which included Deborah O'Neil, Editor of FIU Magazine; Terry Witherell, Vice President for External Relations; Lillian Kopenhaver, Dean Emeritus and Professor; and George Corton, Assistant Vice President for Development. Deborah and Terry suggested "Ignite" as the name or theme of the campaign and Lillian proposed a distinctive pin to recognize donors. Our team spent 2011 planning for the launch of the inaugural 2012 Ignite Campaign. Determined to make the campaign accessible for donors of all giving levels, the basic donation was compared to the cost of a cup of coffee. Beyond a single “cup of coffee,” potential donors were asked to consider pledging a “cup of coffee” each month, or every week. A weekly or monthly pledge could result in a $25 or $100 gift each year. Using the payroll deduction option, the donation would be effortless, and feel good, too. Grounded in this strategy, the Ignite Campaign set out to build the Ignite brand. 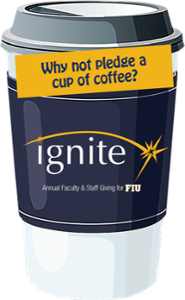 Oscar Negret developed the Ignite logo, the first Ignite pin and the coffee cup pledge-card emblazoned with our motto: “Why not pledge a cup of coffee? We created our Campaign slogan, “Don't give 'til it hurts - give 'til it feels good,” and we set out to reach our ultimate Ignite Campaign goal of 100% faculty and staff participation, encouraging and celebrating gifts of any and every size. The FIU community was also invited to join the Leadership Circle by way of making a five-year commitment to the Ignite Campaign. Officially launched in 2012, the Ignite Campaign’s first year ended with 99 projects established by faculty and staff, a 31% participation rate and $2.9+ million raised. 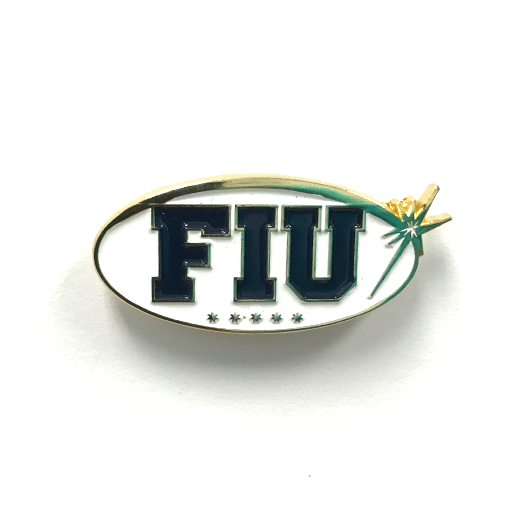 All donors were recognized with the new Ignite pin. In 2013, it was decided that each year the Ignite Campaign would introduce a new design for that particular year while maintaining basic design elements fundamental to the Ignite logo. It was also decided that all pins would always reflect the spark – the symbolic essence of the campaign. This second year our faculty and staff raised $1.1+ million with only 27% of the community participating. 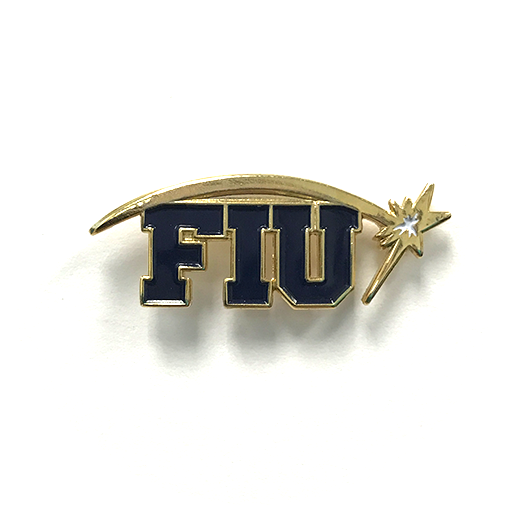 The 2014 Ignite Campaign was marked by a new gold pin and the establishment of the Torchbearer Society: a program designed to recognize faculty and staff who made the decision to leave a legacy at our FIU through planned giving. In its first year, the society inducted six Torchbearers. This third campaign year closed with 34% participation, 106 projects and more than $2.9 million raised. 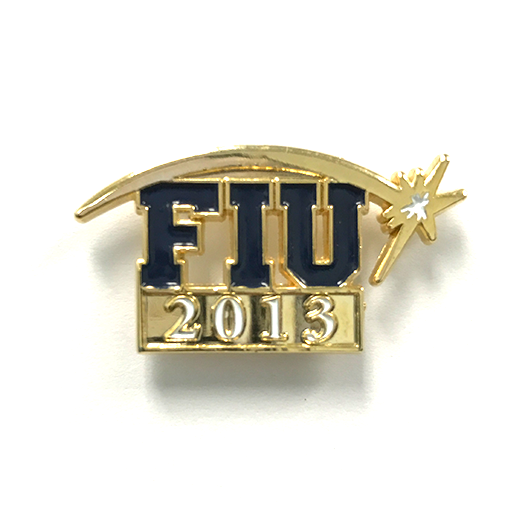 By 2015, the Ignite Campaign was becoming a part of the fabric of our FIU. 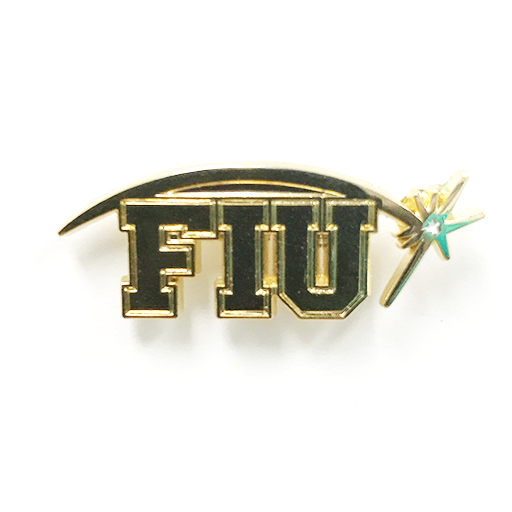 Now in its fourth iteration, the Ignite pin was becoming iconic. The campaign now recognized the eight units who had achieved a participation level of 50% or higher, and the 10 units that reached our 100% participation publicly. At the close of the 2015 campaign year, the faculty and staff had created 121 projects with 41% of the faculty and staff participating. This led to more than $2 million raised, and five new members in the Torchbearer Society. 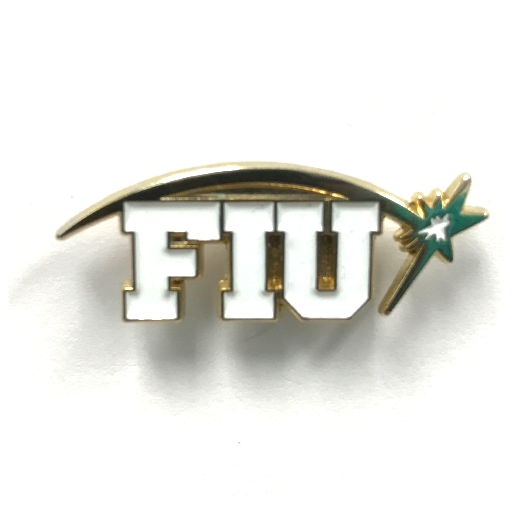 As the 2016 campaign was developing the pin took on a new shape. A second pin was also designed with five stars on it to indicate five years of continuous giving. The year ended with over ten units reaching 50%+ and over 15 units reaching the coveted 100% participation. Two individuals were inducted into the Torchbearer Society. The 2016 Ignite Campaign closed raising $1.8 million and bringing the total raised through Ignite over the first years to $10,991,090.28. As we began 2017 Ignite Campaign, we were empowered by the successes achieved during the previous five years and challenged by what lay ahead. The campaign began with the introduction of a new pin design by Oscar Negret. There were 40 units as the university was organized, and 10 were recognized for having 50%+ participation and 19 were recognized for the highest honor of 100% participation. One individual was inducted into the Torchbearer Society and there were more than 200 projects to which donors could direct their giftsThere were more that 200 projects (giving opportunities) offered to donors. By June 30, the official closing of the 2017 Campaign had reached more than $2 million. The 2017 Ignite Campaign was recognized by CASE (the Council for Advancement And Support of Education) for its outstanding success with their 2018 CASE District III (Southern States) Grand Award for Overall Fundraising Program and 2018 CASE Circle of Excellence Bronze Award (International) for Annual Giving Programs. The theme of the 2018 Ignite Campaign was “Together, we rise!” It turned out to be most successful Ignite Campaign to date. Ignite offered donors more than 200 projects from which they could direct their gifts. 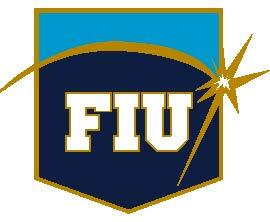 This year the organizational structure of FIU was made up of 39 discrete units. Of these, 20 achieved 100% participation and 14 reached or surpassed 50% participation. The membership of the Torchbearers Society was brought to 22, as five Torchbearer planned gifts were made. We achieved a 73% participation level and raised $12,962,507, bringing the total amount raised in seven years to more than $21 million. As FIU kicks off President Rosenberg’s Next Horizon Capital Campaign, the 2019 Ignite Campaign will play a strong supporting role. We will do this by demonstrating that the faculty and staff understand and appreciate the significance of the mission and vision that has driven our FIU since the beginning. 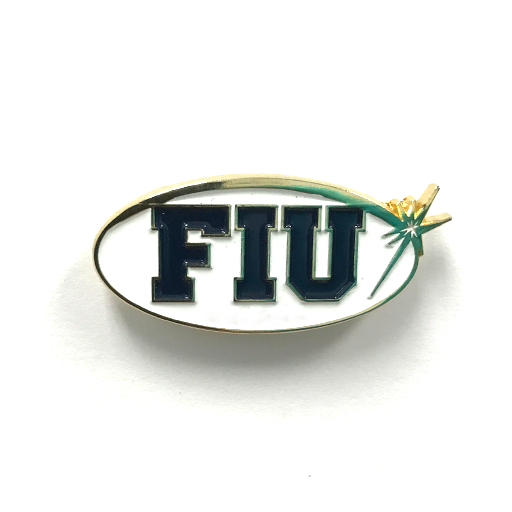 The 2019 Ignite Pin has been designed ot reflect our commitment to supporting our FIU through Ignite. Every gift to our Ignite Campaign represents our belief and commitment to moving toward the Next Horizon.